….and so do our Olympic Themed posts for Lets Lunch. This is exciting. All those countries. All those sports. All those colors!!! And all the wonderful dishes that are about to appear at our Lunch this month. We could chose a dish from a country that is competing and bring it along. I thought about it for a long time before I decided on … no real country at all. It is the beginning of the Mardi Gras season in Louisiana. That means King Cakes. So how about an…. 3. Punch dough down, and transfer to a lightly floured surface. Divide dough into 5 equal portions. Roll the 5 pieces into 5 balls and then into 5 long pieces. 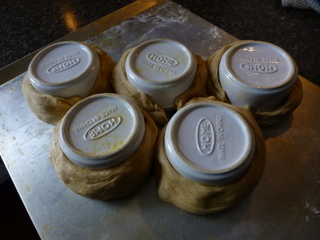 Wrap the five pieces around ramekins or another small round dish. Brush with melted butter. Cover and let rise in a warm, draft-free place until doubled in size, about 1 hour. In a medium bowl, whisk together sugar and milk until smooth. 1. Place 1/3 cup sugar in each of three small resealable plastic bags. 2. In a small bowl, combine red and blue food coloring until it turns purple. Add purple food coloring to one bag, green coloring to another bag, and yellow coloring to third bag; seal bags, and shake each until sugar is even in color. So I guess I did chose a country — the US! But good luck to ALL the extraordinary and brave athletes. Look for the round-up on Betty’s Blog Asian in America. Let’s Lunch (#LetsLunch) is a twitter-based virtual lunch club where anyone interested can join. The theme is posted at the first of the month for the next month. You can visit us on FaceBook. *****I made the dough in the bread machine. Use the dough setting. Same ingredients. Place the liquid ingredients in the machine first and then the mix of dry. I added the 1/2 cup of butter in pieces right after the other ingredients had mixed into a ball. When the dough cycle ends then transfer to the lightly floured surface and continue with the recipe in step 2. I also had more dough than I needed so I made 5 rolls in Texas Muffin Tin. Here are the Olympic Dishes: Enjoy! I love this! 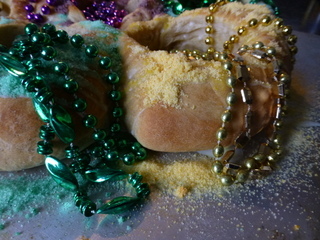 But I confess that I have not yet made a King Cake that was worth eating, after half a dozen tries. They come out very very very dry, and not very ‘risen’. But you have inspired me to try again! Olympic Spirit! And these are precious, with a place to put beads, or goodies. Bling, rings and kings! You need to win a medal for this one, Margaret! Ah, blogging Olympic-themed food is such a clever idea. I am watching the opening ceremonies while reading this morning. And Mardi Gras! You have managed to tie in two very diverse themes here. Beautiful. These are gorgeous Margaret! They look like little pots of gold. 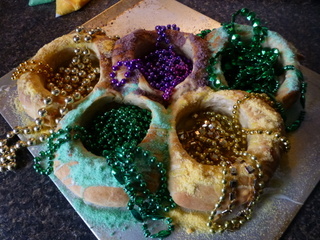 I’ve always wanted to bake a King Cake ~ thanks for giving me a recipe to start! What a magnificent Olympic cake. The colors make it look so rich and regal. Glad to do Let’s Lunch with you this month!